Modern design, engineering, and manufacturing technology have produced outstanding multiengine airplanes. Their utility and acceptance have more than fulfilled the expectations of their builders. As a result of this rapid development and increasing use, many pilots have found it necessary to make the transition from single engine airplanes to those with two or more engines and complex equipment. Good basic flying habits formed during earlier training, and carried forward to these new sophisticated airplanes, will make this transition relatively easy, but only if the transition is properly directed. The following paragraphs discuss several important operational differences which must be considered in progressing from the simpler single engine airplanes to the more complex multiengine airplanes. 1. Preflight Preparation. The increased complexity of multiengine airplanes demands the conduct of a more systematic inspection of the airplane before entering the cockpit, and the use of a more complete and appropriate checklist for each ground and flight operation. Preflight visual inspections of the exterior of the airplane should be conducted in accordance with the manufacturer's operating manual. The procedures set up in these manuals usually provide for a comprehensive inspection, item by item in an orderly sequence, to be covered on a complete check of the airplane. The transitioning pilot should have a thorough briefing in this inspection procedure, and should understand the reason for checking each item. 2. Checklists. Essentially, all modern multiengine airplanes are provided with checklists, which may be very brief or extremely comprehensive. A pilot who desires to operate a modern multiengine airplane safely has no alternative but to use the checklist pertinent to that particular airplane. Such a checklist normally is divided under separate headings for common operations, such as before starting, takeoff, cruise, in range, landing, system malfunctions, and engine out operation. The transitioning pilot must realize that multiengine airplanes characteristically have many more controls, switches, instruments, and indicators. Failure to position or check any of these items may have much more serious results than would a similar error in a single engine airplane. Only definite procedures, systematically planned and executed can ensure safe and efficient operation. 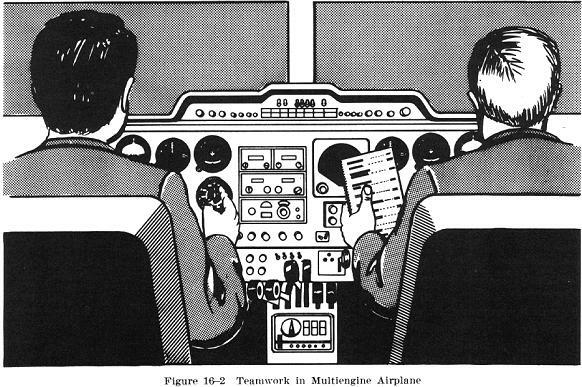 The cockpit checklist provided by the manufacturer in the operations manual must be used, with only those modifications made necessary by subsequent alterations or additions to the airplane and its equipment. In airplanes which require a copilot, or in which a second pilot is available, it is good practice for the second pilot to read the checklist, and the pilot in command to check each item by actually touching the control or device and repeating the instrument reading or prescribed control position in question, under the careful observation of the pilot calling out the items on the checklist (Fig. 16-2). Even when no copilot is present, the pilot should form the habit of touching, pointing to, or operating each item as it is read from the checklist. In the event of an in-flight emergency, the pilot should be sufficiently familiar with emergency procedures to take immediate action instinctively to prevent more serious situations. However, as soon as circumstances permit, the emergency checklist should be reviewed to ensure that all required items have been checked. 3. Taxiing. The basic principles of taxiing which apply to single engine airplanes are generally applicable to multiengine airplanes. Although ground operation of multiengine airplanes may differ in some respects from the operation of single engine airplanes, the taxiing procedures also vary somewhat between those airplanes with a nosewheel and those with a tailwheel type landing gear. With either of these landing gear arrangements, the difference in taxiing multiengine airplanes that is most obvious to a transitioning pilot is the capability of using power differential between individual engines to assist in directional control. Tailwheel type multiengine airplanes are usually equipped with tailwheel locks which can be used to advantage for taxiing in a straight line especially in a crosswind. The tendency to weathervane can also be neutralized to a great extent in these airplanes by using more power on the upwind engine, with the tailwheel lock engaged and the brakes used as necessary. On nosewheel type multiengine airplanes, the brakes and throttles are used mainly to control the momentum, and steering is done principally with the steerable nosewheel. The steerable nosewheel is usually actuated by the rudder pedals, or in some airplanes by a separate hand operated steering mechanism. No airplane should be pivoted on one wheel when making sharp turns, as this can damage the landing gear, tires, and even the airport pavement. All turns should be made with the inside wheel rolling, even if only slightly. Brakes may be used, as with any airplane, to start and stop turns while taxiing. When initiating a turn though, they should be used cautiously to prevent overcontrolling of the turn. Brakes should be used as lightly as practicable while taxiing to prevent undue wear and heating of the brakes and wheels, and possible loss of ground control. When brakes are used repeatedly or constantly they tend to heat to the point that they may either lock or fail completely. Also, tires may be weakened or blown out by extremely hot brakes. Abrupt use of brakes in multiengine as well as single engine airplanes, is evidence of poor pilot technique; it not only abuses the airplane, but may even result in loss of control. Due to the greater weight of multiengine airplanes, effective braking is particularly essential. Therefore, as the airplane begins to move forward when taxiing is started, the brakes should be tested immediately by depressing each brake pedal. If the brakes are weak, taxiing should be discontinued and the engines shut down. Looking outside the cockpit while taxiing becomes even more important in multiengine airplanes. Since these airplanes are usually somewhat heavier, larger, and more powerful than single engine airplanes they often require more time and distance to accelerate or stop, and provide a different perspective for the pilot. While it usually is not necessary to make S-turns to observe the taxiing path, additional vigilance is necessary to avoid obstacles, other aircraft, or bystanders. 4. Use of Trim Tabs. The trim tabs in a multiengine airplane serve the same purpose as in a single engine airplane, but their function is usually more important to safe and efficient flight. This is because of the greater control forces, weight, power, asymmetrical thrust with one engine inoperative, range of operating speeds, and range of center of gravity location. In some multiengine airplanes it taxes the pilot's strength to overpower an improperly set elevator trim tab on takeoff or go-around. Many fatal accidents have occurred when pilots took off or attempted a go-around with the airplane trimmed "full nose up" for the landing configuration. Therefore, prompt retrimming of the elevator trim tab in the event of an emergency go-around from a landing approach is essential to the success of the flight. Multiengine airplanes should be retrimmed in flight for each change of attitude, airspeed, power setting, and loading. Without such changes, constant application of firm forces on the flight controls is necessary to maintain any desired flight attitude. 5. Normal Takeoffs. There is virtually little difference between a takeoff in a multiengine airplane and one in a single engine airplane. The controls of each class of airplane are operated the same; the multiple throttles of the multiengine airplane normally are treated as one compact power control and can be operated simultaneously with one hand. In the interest of safety it is important that the flight crew have a plan of action to cope with engine failure during takeoff. 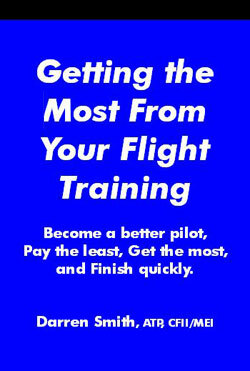 It is recommended that just prior to takeoff the pilot in command review, or brief the copilot on takeoff procedures. This briefing should consist of at least the engine out minimum control speed, best all engine rate of climb speed, best single engine rate of climb speed, and what procedures will be followed if an engine fails prior to reaching minimum control speed. This latter speed is the minimum airspeed at which safe directional control can be maintained with one engine inoperative and one engine operating at full power. The multiengine (light twin) pilot's primary concern on all takeoffs is the attainment of the engine out minimum control speed prior to liftoff. Until this speed is achieved, directional control of the airplane in flight will be impossible after the failure of an engine, unless power is reduced immediately on the operating engine. If an engine fails before the engine out minimum control speed is attained, THE PILOT HAS NO CHOICE BUT TO CLOSE BOTH THROTTLES, ABANDON THE TAKEOFF, AND DIRECT COMPLETE ATTENTION TO BRINGING THE AIRPLANE TO A SAFE STOP ON THE GROUND. The multiengine (light twin) pilot's second concern on takeoff is the attainment of the single engine best rate of climb speed in the least amount of time. This is the airspeed which will provide the greatest rate of climb when operating with one engine out and feathered (if possible), or the slowest rate of descent. In the event of an engine failure, the single engine best rate of climb speed must be held until a safe maneuvering altitude is reached, or until a landing approach is initiated. When takeoff is made over obstructions the best angle of climb speed should be maintained until the obstacles are passed, then the best rate of climb maintained. The engine out minimum control speed and the single engine best rate of climb speed are published in the airplane's FAA approved flight manual, or the Pilot's Operating Handbook. These speeds should be considered by the pilot on every takeoff, and ar discussed in later sections of this chapter. 6. Crosswind Takeoffs. Crosswind takeoffs are performed in multiengine airplanes in basically the same manner as those in single engine airplanes. Less power may be used on the downwind engine to overcome the tendency of the airplane to weathervane at the beginning of the takeoff, and then full power applied to both engines as the airplane accelerates to a speed where better rudder control is attained.